We’ve already seen so many variations in terms of art mediums and techniques – from the various forms of digital media such as concept art and digital illustrations to the different traditional methods like paper crafting and other unusual art mediums. And today we continue to introduce you to another rare form of art using fire as the primary medium that has been around for centuries but not given that much attention. Some of you might already have heard of it but for those who are just exploring the world of fine art, we give you a closer look on the art of wood burning also known as “pyrography”. Pyrography is defined as the art of decorating wood or other materials like paper by burning the surfaces and leaving burn marks created using a heated object such as a poker. From a Greek origin, the term pyrography means “writing with fire”. With varied types of tip used, a large range of shades and tones can be created. Most of the time, after the design is burned on the material, it is being colored using different pigments and other coloring materials. And to further appreciate this amazing art form, we here at You The Designer will introduce you to some of the most talented pyrographic artists today. Some of them are already well known in this field while some are just starting to explore the potential of this artistic medium. Enjoy! Influenced with science, humor and pop culture, Fay Helfer has been creating amazing works of pyrography with combination of natural pigments. She’s from San Francisco Bay Area, CA and holds an MFA from the Savannah College of Art and Design. Her works are simply magical! “Headache” – pyrography with natural pigments, and pastel on wood. Australian illustrator, teacher and draftsman David Stanley is very passionate about wood crafts inspired by the craftmanship of others and enjoying friendship with fellow woodworkers. His masterpeices in love-spoon carving and pyrography has been around the world and a great source of inspiration for others. Not much is known about this artist but Jean Bouick‘s art of pyrography is just amazing. Her videos over YouTube gives us all the details on the process of producing such wonderful masterpieces. The 60 year old Romanian artist, Dino Muradian – also known as “muradino” in most of his online profiles – has been doing the art of pyrography almost within his entire life. His idea about this art is self taught and has been a hobby for 20 years until some of his pieces were sold that triggered his successful career in the world of pyrography. His works are not limited to wood, he also does pyrography on paper, leather, bones and gourds and any other things with the wooden texture. The latest is probably his works on wooden violins. American artist Brandon Jones just recently started wood burning as of December 2011. With a little experience on the art of pyrography, he already produced wonderful pieces influenced by pop culture, natural elements and personal thoughts. Davide Della Noce is an Italian artist who have loved drawing since he was a kid. His passion for art and love for animals inspired him to pursue a career in art and design. His amazing art of pyrography is his unique way of expression and a fusion of all those elements. Last but not the least is self-taught artist Julie Bender. Much like Davide Della Noce, her works include stunning pyrography pieces featuring animals and nature – capturing every single detail. She earned her degree in Fine Arts in 1980, and discovered the art of pyrography in 2002 and decided to pursue the unique artistic medium. NOTE: Images on this page are not owned by YouTheDesigner and are used solely as design examples and inspiration. All images might be subject to copyright by their respective owners. Please click on each image to see their original sources. So there you have them guys! Which works are your most favorite? 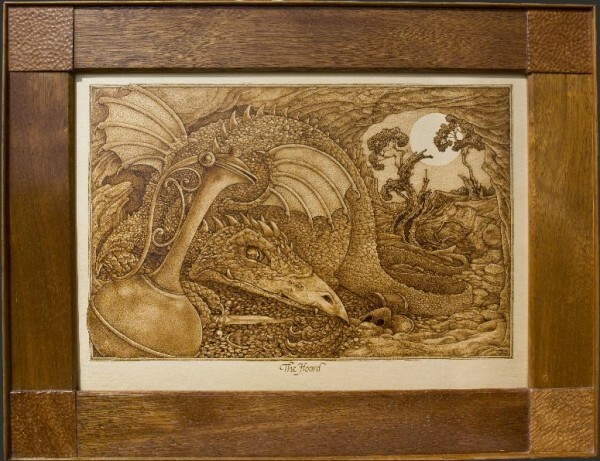 Have we missed other artists you know in the world of pyrography? Then tell us about them as well as your thoughts and suggestions by commenting below. Find us on Facebook, Twitter and Google Plus for more updates, design news and features, or better yet subscribe to our blog for the latest design inspirations, stories and freebies. Stay awesome everyone!